We receive many emails from our readers asking us how to record performance test script in JMeter. So, we decided to write this small article to show you how we can record script in JMeter. Read on! We will be using latest JMeter version 2.11 for our example. We will use HTTP(S) Test Script Recorder element for recording purpose. However, let’s first of all clear some basics. 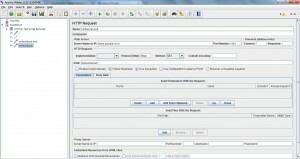 For recording, JMeter relies on its proxy server. It’s proxy is used to intercept the browser requests. So we’ll be changing our browser’s proxy settings to match with JMeter’s. Armed with this much information, follow below steps to record our test script. Right click WorkBench and select Add–>Non-Test Elements–>HTTP(S) Test Script Recorder. Take a good look over the opened element in JMeter window. It has various fields. We will cover only the important ones. For comprehensive list, check out JMeter’s official documentation. Under Global Settings section, you can see Port field. You can modify this value to make JMeter proxy running on your choice of port. But leave it as it is for now. Check Target Controller field under Test Plan Content section. This is where JMeter will record all the browser requests. We have selected ‘WorkBench > HTTP(S) Test Script Recorder’ option for our purpose. By default JMeter records every browser requests(Eg. .jpg, .js, .css etc). This makes recording cumbersome as these requests may be unnecessary during test execution. 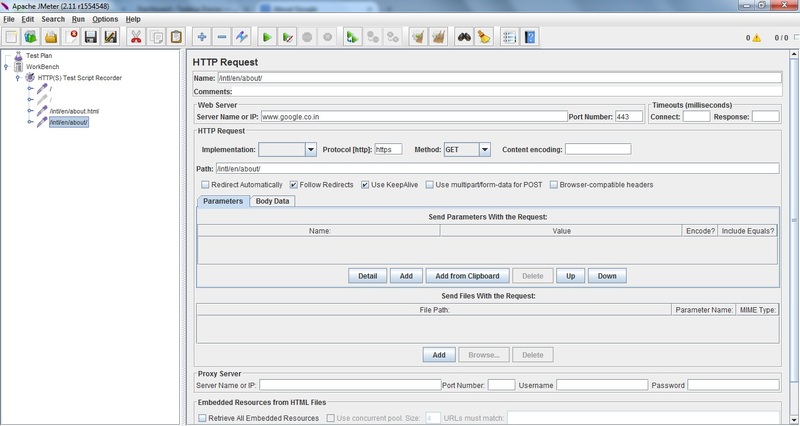 We can configure JMeter to include or exclude certain requests in ‘URL Patterns to Include’ and ‘URL Patterns to Exclude’ sections. Click ‘Add Suggested Excludes’ button to exclude unnecessary requests. You can also manually specify other requests by clicking Add button. Your HTTP(S) Test Script Recorder is configured now. Click Start button to start JMeter proxy. It’s time to configure our browser to match with JMeter proxy now. Change your browser’s proxy settings to ‘localhost’ as HTTP Proxy and 8080 as Port. In Firefox, this setting can be found at Tools–>Options–>Advanced–>Network option. To be on safer side, also check the ‘Use this proxy server for all protocols’ option. Now, open your application in browser and start browsing. JMeter should be able to record all the steps. We hope the above steps sheds some light on how to record script in JMeter. Let us know if you found it useful. I am stuck in recording HTTPS page for an Hybrid Mobile App. Can anyone help me out please in recording it ?? Every setting is done Change Proxy in Firefox Proxy Server from Jmeter and Firefox browser. But while Clicking on Start Button in HTTPs Record Test Script and then Recording the through Firefox browser, then clicking on Stop Button. But It is not showing Recorded Script. Please somebody Help me regarding above Issue. can anyone explain how to record a test for web application..i tried so many times but it is not getting record…..
How do you set up authentication using cookies?